We were in Mira Loma for a couple of days (more on why, later). Two days (count 'em - two) before we left to come here, I was friended on Facebook by a woman who loved my book and just happened to have started working at…(cue karmic music)... the Mira Loma Borders. 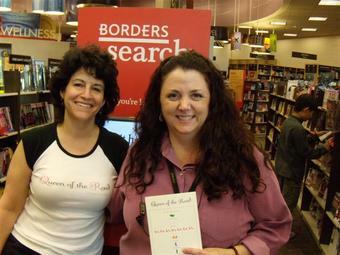 She said she loved QUEEN OF THE ROAD so much, she even picked it as a book club pick at her previous Borders in Riverdale (where, everyone else loved it to. I'm just sayin'...) As you know, I hadn’t posted anything about coming to Mira Loma on this blog or Facebook, or anywhere. I guess as Tim and I are getting closer to Boulder, we can't escape The People's Republic and its ugga bugga charms. Borders, take note: Leslie Johnston Perdue is going places! This page contains a single entry from the blog posted on January 11, 2009 11:52 AM. The previous post in this blog was A "Pleasant" Interlude. The next post in this blog is A Resort Fit For A Queen.